Depoe Bay was named for Siletz Indian Charles "Charley" Depot who was originally allotted the land in 1894 as part of the Dawes Act of 1887. There are conflicting accounts of the origin of his name. One says he was given the name "Depot Charley" for working at the military depot near Toledo, Oregon. The family was later known as "DePoe". His original tribal affiliation was Tututni. In 1975, the fishing trip sequence in One Flew Over the Cuckoo's Nest was filmed in Depoe Bay. In 2008, restaurant scenes from The Burning Plain were filmed in Depoe Bay, at the Tidal Raves restaurant. On March 11, 2011, Depoe Bay's port was damaged by a tsunami caused by the Tōhoku earthquake off the coast of Japan. On August 21, 2017, Depoe Bay became one of the first places in the United States to witness totality of the solar eclipse. According to the United States Census Bureau, the city has a total area of 1.81 square miles (4.69 km2), all of it land. As of the census of 2010, there were 1,398 people, 714 households, and 411 families residing in the city. The population density was 772.4 inhabitants per square mile (298.2/km2). There were 1,158 housing units at an average density of 639.8 per square mile (247.0/km2). The racial makeup of the city was 92.9% White, 1.5% Native American, 1.2% Asian, 0.2% Pacific Islander, 1.5% from other races, and 2.6% from two or more races. Hispanic or Latino of any race were 4.8% of the population. There were 714 households of which 10.6% had children under the age of 18 living with them, 48.7% were married couples living together, 6.0% had a female householder with no husband present, 2.8% had a male householder with no wife present, and 42.4% were non-families. 32.8% of all households were made up of individuals and 13.3% had someone living alone who was 65 years of age or older. The average household size was 1.96 and the average family size was 2.39. The median age in the city was 56.6 years. 9.7% of residents were under the age of 18; 5% were between the ages of 18 and 24; 16.5% were from 25 to 44; 38.9% were from 45 to 64; and 29.8% were 65 years of age or older. The gender makeup of the city was 48.1% male and 51.9% female. As of the census of 2000, there were 1,174 people, 584 households, and 359 families residing in the city. The population density was 652.2 people per square mile (251.8/km²). There were 911 housing units at an average density of 506.1 per square mile (195.4/km²). The racial makeup of the city was 92.50% White, 0.34% African American, 1.70% Native American, 0.60% Asian, 0.17% Pacific Islander, 1.02% from other races, and 3.66% from two or more races. Hispanic or Latino of any race were 3.58% of the population. There were 584 households out of which 17.0% had children under the age of 18 living with them, 51.4% were married couples living together, 7.0% had a female householder with no husband present, and 38.5% were non-families. 31.0% of all households were made up of individuals and 11.3% had someone living alone who was 65 years of age or older. The average household size was 2.01 and the average family size was 2.43. In the city, the population was spread out with 14.4% under the age of 18, 3.9% from 18 to 24, 22.1% from 25 to 44, 35.7% from 45 to 64, and 23.9% who were 65 years of age or older. The median age was 50 years. For every 100 females, there were 99.0 males. For every 100 females age 18 and over, there were 93.6 males. The median income for a household in the city was $35,417, and the median income for a family was $43,967. Males had a median income of $28,750 versus $25,469 for females. The per capita income for the city was $24,994. About 5.5% of families and 8.0% of the population were below the poverty line, including 15.1% of those under age 18 and 2.1% of those age 65 or over. Depoe Bay is served by radio station KPPT-FM, licensed to broadcast at 100.7 MHz. Owned by Agpal Broadcasting, the station specializes in classic hits. ^ Strictly speaking, Depoe Bay can only claim to be the world's smallest natural navigable harbor. For example, Seacliff in Scotland is smaller, but was built artificially. ^ a b "US Gazetteer files 2010". United States Census Bureau. Retrieved December 21, 2012. ^ a b "Depot Bay". Geographic Names Information System. United States Geological Survey (USGS). November 28, 1980. Retrieved March 4, 2015. ^ a b c d e f g h i "American FactFinder". United States Census Bureau. Retrieved December 21, 2012. 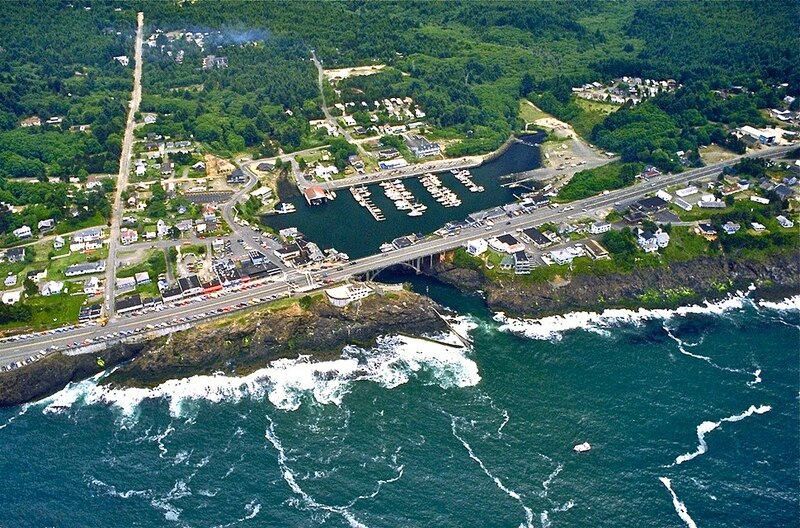 ^ "City of Depoe Bay (World's Smallest Navigable Harbor)". City of Depoe Bay. Retrieved December 28, 2013. ^ "World's Smallest Navigable Harbor". Depoe Bay Chamber of Commerce. Retrieved December 28, 2013. ^ "The world's smallest natural harbor used to be even smaller". ^ a b "Depoe Bay History". Central Oregon Coast Journal. Retrieved June 17, 2012. ^ "Depoe Bay: Community Profiles for West Coast and North Pacific Fisheries, Washington, Oregon, California, and other U.S. States" (PDF). NOAA Technical Memorandum NMFS-NWFSC-85. p. 274. Retrieved June 17, 2012. In 1894 the U.S. government allotted lands around Depoe Bay to Charles Depot, a local Siletz Indian chief and tribal judge. Mr. Depot was given the name because he worked at the military train depot near Toledo, Oregon. ^ "Depoe Bay History". City of Depoe Bay. Retrieved June 17, 2012. One of those who were forcibly removed to the Coast Reservation from his ancestral home in the Rogue (Tutuni) River Valley, was a young Tutuni/Joshua Indian named Charles. Minutes from the Council held at the Siletz Agency on December 15, 1873 with Chiefs of the Confederated Tribes reflect the following statement by "Depot Charlie". ^ Depoe Bay History, "The July 12, 1918 edition of the Lincoln County Leader reported: Charlie DePoe, a leading man among the Indians, was a chief of the Joshua tribe and was noted for his good sense and wise councils and hospitality among the Indians. No one ever went away hungry from the home of DePoe Charlie." ^ Schwartz, E.A. (1997). The Rogue River Indian War and Its Aftermath, 1850–1980. Norman, Oklahoma: University of Oklahoma Press. pp. 303–04. ISBN 0-8061-2906-9. ^ "One Flew Over the Cuckoo's Nest (1975) - Filming Locations". imdb.com. Retrieved April 7, 2009. ^ Rollins, Michael (January 17, 2008). "Charlize, meet Gracie. Hollywood comes to Depoe Bay". The Oregonian. Retrieved October 29, 2009. ^ "KPPT-FM". Federal Communications Commission. Retrieved March 4, 2015. ^ "Radio Locator: KPPT-FM 100.7 MHz". Theodric Technologies. 2015. Retrieved March 4, 2015. The 30 foot surf rescue boat is a lifeboat that the United States Coast Guard has used in recent years. The 30' long boat is designated the surf rescue boat (SRB) and was introduced in 1983. Arthur Thieme (July 9, 1941 – May 26, 2015) was an American folk musician. He specialized in traditional songs and stories from the Upper Midwest, though he collected and performed cowboy songs from the West as well. He was assistant manager of the Old Town Folklore Center in Chicago - 1964-1965 & 1966 (retail outlet for the Old Town School of Folk Music), ran The Folk Art Shop in Depoe Bay, Oregon with his wife Carol in 1967 and 1968, sang all over the country for many years -including 37 years singing at the No Exit Cafe & Gallery in Chicago. He played in schools in the 6 counties in and around Chicago through the Urban Gateways arts & education agency for 22 years, was a host of National Public Radio's "Flea Market" radio show broadcast live from the Old Town School of Folk Music every Sunday afternoon in the mid-1980s, sang and told tales for about a decade on the steamboat Julia Belle Swain and the diesel boat Twilight on the Mississippi and Illinois Rivers. A photographer pre 1960 through part of the 2000s (decade), Art has made his photos available to the public on the Mudcat internet site. Bertha Muzzy Sinclair or Sinclair-Cowan, née Muzzy (November 15, 1871 – July 23, 1940), best known by her pseudonym B. M. Bower, was an American author who wrote novels, fictional short stories, and screenplays about the American Old West. Her works, featuring cowboys and cows of the Flying U Ranch in Montana, reflected "an interest in ranch life, the use of working cowboys as main characters (even in romantic plots), the occasional appearance of eastern types for the sake of contrast, a sense of western geography as simultaneously harsh and grand, and a good deal of factual attention to such matters as cattle branding and bronc busting." She was married three times: to Clayton Bower in 1890, to Bertrand William Sinclair (also a Western author) in 1905, and to Robert Elsworth Cowan in 1921. However, she chose to publish under the name Bower. Bertrand T. Sperling (born 1950 in Brooklyn, New York) is an author and researcher. His books and studies on quality of life in America have made him "an internationally recognized expert on cities." Boiler Bay State Scenic Viewpoint is a state park in the U.S. state of Oregon, administered by the Oregon Parks and Recreation Department. The park is one mile (1.6 km) north of Depoe Bay, Oregon. Boiler Bay Viewpoint overlooks the small Boiler Bay. Boiler Bay was named after the vessel J. Marhoffer was run aground in the small bay—then known as Brigg's Landing—on May 18, 1910, after a fire spread throughout the engine room. Soon after, the burning 175-foot (53 m) schooner's fuel tanks exploded. Witnesses claim debris was launched nearly a half mile to a mile inland. The remains of the vessel were left in the bay, including her engine boiler. Today, the boiler can still be seen at extreme low tides. Conde Balcom McCullough (May 30, 1887 – May 5, 1946) was an American bridge engineer who is primarily known for designing many of Oregon's coastal bridges on U.S. Route 101. The native of South Dakota worked for the Oregon Department of Transportation from 1919 to 1935 and 1937 until 1946. McCullough also was a professor at Oregon State University. The Depoe Bay Bridge is one of a series of significant bridges along the Oregon Coast Highway. The concrete arch bridge spans the mouth of Depoe Bay at milepost 127.61 with a 150-foot (46 m) main span, and a total length of 312 feet (95 m). The bridge's designer was Conde McCullough who designed all of the 1920s bridges on the highway. The original bridge, completed in 1927, was only 18 feet (5.5 m) wide from curb to curb with no sidewalks, and was widened in 1940 with a similar arched concrete bridge immediately adjacent to the original. The added structure is sympathetic to the original and is included in the National Register of Historic Places listing. The Depoe Bay Whale Watching Center, also known as the Depoe Bay Ocean Wayside, is an Oregon State Parks-staffed visitor center in Depoe Bay, Oregon, U.S. to help visitors observe whale migration and provide information about whales and other marine mammals, including history, economics, and their environmental and ecological influences. The wayside provides a sheltered platform from which to view the ocean. First established as a wayside parking area on the Oregon Coast Highway in 1930, the wayside building was built in 1956 as a restroom facility for the popular spot. It is located just to the north of the Depoe Bay Bridge, also on the National Register. E.M.I.L.Y. (sometimes, EMILY or Emily; acronym for Emergency Integrated Lifesaving Lanyard) is a robotic device used by lifeguards for rescuing swimmers. It operates on battery power and is operated by remote control after being dropped into the water from shore, a boat or pier, or helicopter. Using an impeller motor to travel through water, it is able to reach victims much faster than a human lifeguard can by swimming, and it is more compact and less expensive to maintain than manned watercraft. It can also operate in weather and surf conditions that make other rescue attempts impractical. Once it reaches the victims its foam core allows it to function as a flotation device for up to 4-6 people holding onto side ropes or handles.Emily was created by inventor Anthony Mulligan and Robert Lautrup, and named after Marie Mulligan's friend, who died in a car accident. It was first tested in Zuma Beach near Malibu, California, and at Depoe Bay, Oregon and Westerly, Rhode Island beginning early 2010. In July 2012, lifeguards there made one of the first rescues using Emily, pulling a father and son to shore after they had been caught in a rip current.A new multi-day duration gasoline powered variant of EMILY for ocean-based storm tracking and weather data collection has been developed under funding by NOAA. In January 2016 EMILY joined a Roboticists Without Borders team from The University of Texas A&M Center for Robotic Assisted Search and Rescue on a successful mission to Lesvos Island, Greece to assist in ocean rescues of Syrian refugees crossing the Aegean Sea from Turkey to Greece. In the first few days of embedded missions with the Hellenic Red Cross, EMILY assisted the Red Cross and other lifeguard organizations to help 250+ refugees safely come ashore on Lesvos. There are currently systems with the Hellenic Red Cross, the Hellenic Coast Guard, and in Turkey. KPPT-FM (100.7 FM) is a radio station broadcasting a classic hits format. Licensed to Depoe Bay, Oregon, United States. The station is currently owned by Agpal Broadcasting Inc. This is a list of FM radio stations in the United States having call signs beginning with the letters KN through KP. The following is a list of Oregon counties and places in order of per capita income. Oregon has the twenty-third highest per capita income in the United States of America, at $20,940 (2000). Its personal per capita income is $29,340 (2003). ĆĆMyrtle Watkins (June 23, 1908 – November 10, 1968) was an American-born Mexican dancer, jazz and Latin American music singer, and actress, who came to be known in the United States and Mexico as Paquita Zarate. Psilocybe azurescens is a psychedelic mushroom whose main active compounds are psilocybin and psilocin. It is among the most potent of the tryptamine-bearing mushrooms, containing up to 1.8% psilocybin, 0.5% psilocin, and 0.4% baeocystin by dry weight, averaging to about 1.1% psilocybin and 0.15% psilocin, makes it one of the strongest mushrooms in psilocybe genus. It belongs to the family Hymenogastraceae in the order Agaricales. The ocean portion of the cove is protected as a marine reserve, and land portions of the cove are protected as parts of Rocky Creek State Scenic Viewpoint and Oregon Islands National Wildlife Refuge.